Snyder during his Boardman Barnes & Noble signing. Photo courtesy of Boardman Barnes & Noble Facebook. 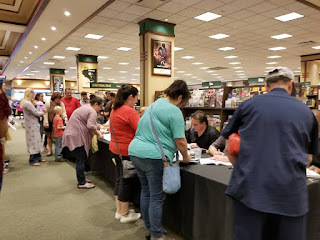 Fresh off a handful of book signings across the Mahoning Valley including a very successful one at the Boardman Barns & Noble two weeks ago, former pro boxer turned author Craig Snyder will be heading across the state border to Erie, PA for his next signing in support of his book "The Boxers of Youngstown: Boxing Capital of the World" which he released in April. Synder, who claimed the International Boxing Council Americas Jr Middleweight title on November 23, 1994, with a victory over Tommy Small and finished his professional career which spanned from 1986 to 1996 with an 18-8 record, will be joined at the signing by Erie boxing legends Mighty Mike Maggio and Johnny Bizzarro Jr. this upcoming Saturday, June 2nd at the Barnes & Noble in Erie between 3:00-5:00 PM. Maggio finished his career with a 15-1-1 record over his career that spanned from 1992 thru 1994 while Bizzarro Jr. compiled a 38-9-3 record from 1983 to 2001 and held the IBO and IBC World Welterweight titles and the WBF super lightweight title. The Erie Barnes & Noble is located at 5909 Peach Street.